Who doesn’t enjoy a good tide pooling excursion? There are so many fascinating and unusual creatures to be found existing solely at the rocky shore. Kids and adults alike find this ecosystem extremely intriguing. Yet the majority of visitors to the rocky shore know very little about the animal and plant organisms they are discovering. If you wish to explore New England’s rocky shore, you should definitely look up Coast Encounters before going on your next New England coastline journey…you will not regret it! This past Sunday I had the pleasure of experiencing a Coast Encounters excursion. Carol Steingart, a marine science educator, started her Coast Encounters business around twenty years ago. 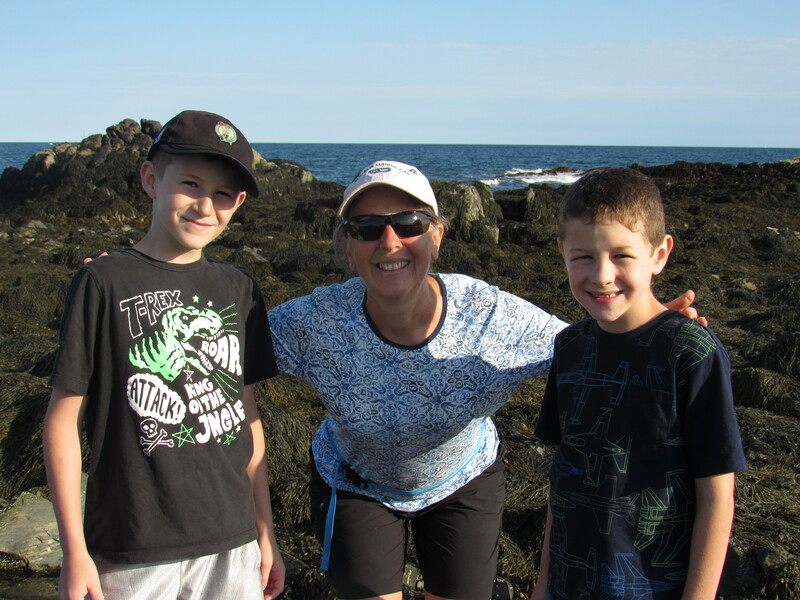 She provides intertidal programs that include educational expeditions for small groups at the rocky shore, as well as onsite programs at schools and other locations. Steingart is very passionate and knowledgeable about the intertidal ecosystem and its algae and creatures. Two of my sons (along with another family) enjoyed spending a beautiful Sunday afternoon with Steingart in Kennebunk, Maine. “Coastal Carol” did a great job of preparing everyone for their wet and rocky journey by ensuring they had adequate footwear and a good understanding of how to navigate this precarious, slippery ecosystem. Steingart guided us through the intertidal region from creature to creature and algae to algae, providing many fascinating details about each organism that were found. Our three hour program was so full of facts and fun that it was hard to coax my boys from the shore when our journey was over. We thoroughly enjoyed the view, the organisms, the adventure and our great educator! If you want to learn more about “Coastal Carol” and Coast Encounters, the “Tourist News” recently wrote an in-depth article. You should also check out Coast Encounter’s website and Facebook page! I’m blown away by your knowledge and expertise!! So proud!! !